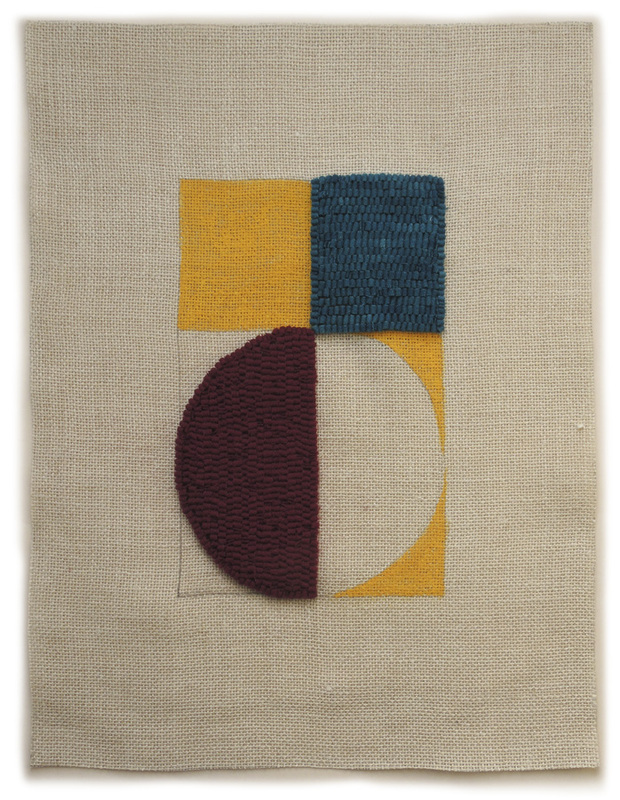 2015 #16, hand dyed wool and egg tempera on linen, 15 x 12 in. 2015 #17, hand dyed wool and egg tempera on linen, 17 1/2 x 17 in. 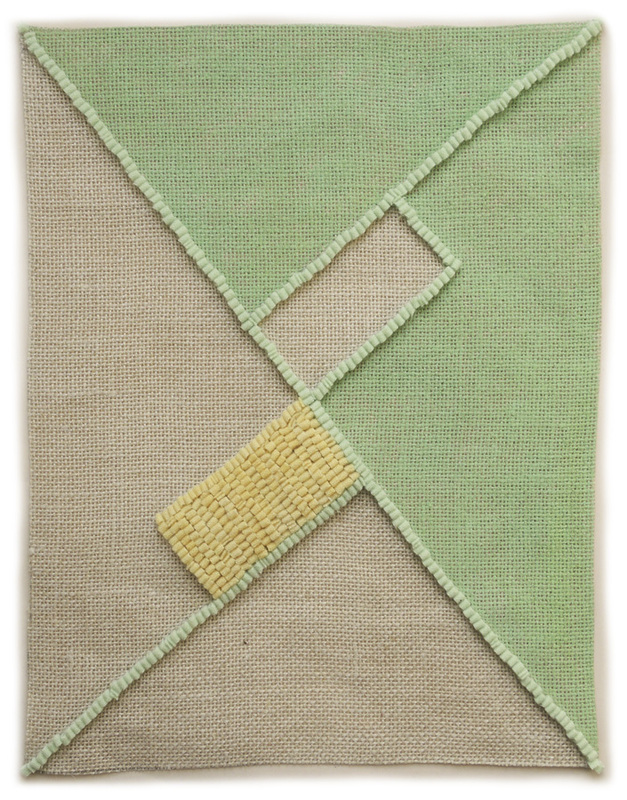 2015 #18, hand dyed wool and egg tempera on linen, 17 3/8 x 16 1/2 in. 2015 #19, hand dyed wool and egg tempera on linen, 19 1/2 x 15 in. ...and finally a split rectangle filled with a circle and smaller rectangle. I did have some funny problems with two of these, with what I described as un-mindfulness to a friend. I was sitting and happily working on 2015 #19, hooking the dark red semi-circle, when I realized, after more than an hour of work, that I was hooking the wool on the wrong side of the circle! 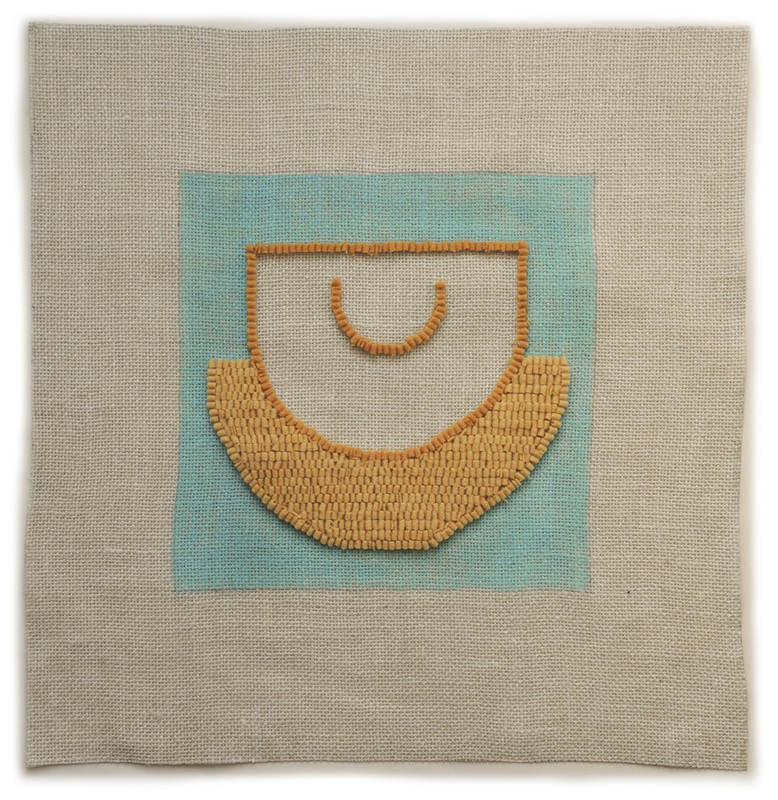 There was no salvaging it, so I had to re-cut and re-draw and re-paint the piece of linen. My other mistake was with 2015 #17: I didn't pay attention to how much wool I had in the orange color of the lines; I thought there was enough, but it wasn't even close. So, I hooked a darker color for the large hooked shape (I tend to use my wool leftovers for these pieces, of which I have large piles) but it looked awful. 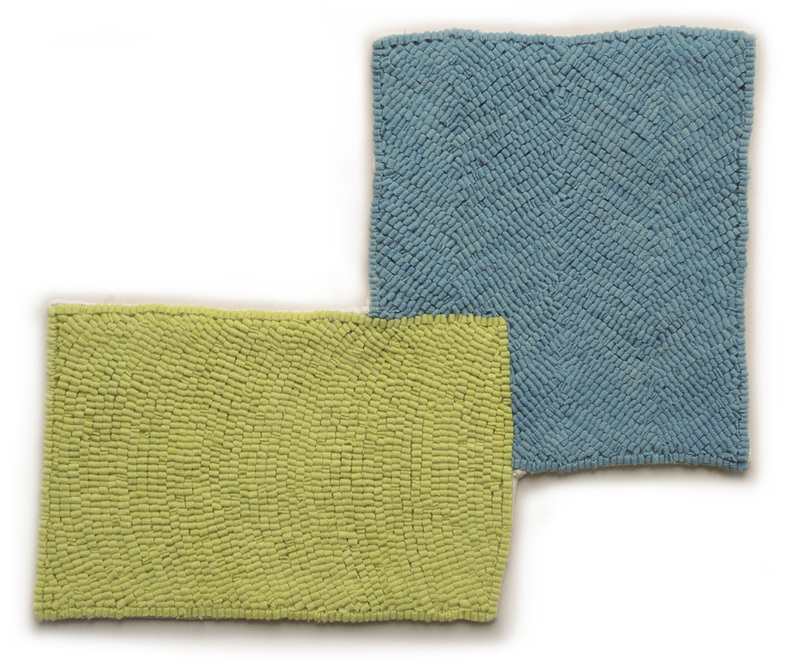 So I had to dye a piece of wool in order to finish; I deliberately made it a lighter color, which worked a lot better than the darker one. 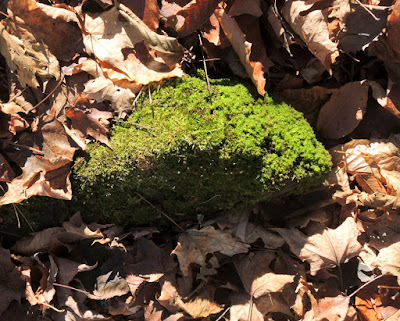 Sometimes the work goes smoothly, and other times there are bumps in the road; sometimes the work isn't even salvageable, but happily, in this case, with some do-overs, it all worked out. In this season of giving thanks I am grateful to the museums and galleries which mount great, and even not so great, shows. I am especially grateful for the joy of discovering art that I love that is new to me. 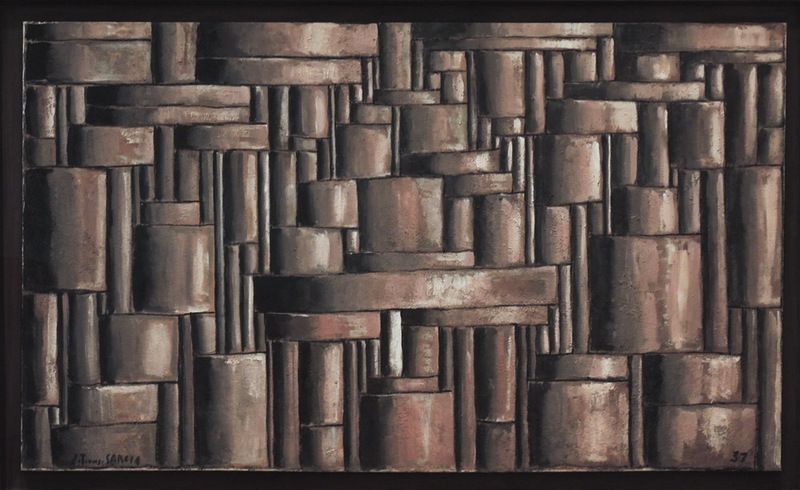 I was thrilled recently while seeing the current exhibition at MoMA, Joaquin Torres-Garcia: The Arcadian Modern. The first thing that caught my eye were painted abstracted figures, and a group of wonderfully fanciful toys! 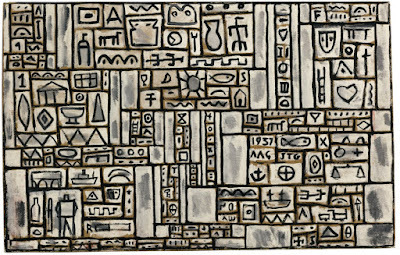 Grafismo Infinito, 1937; oil on cardboard mounted on wood, 21 1/4 x 33 1/4 in. 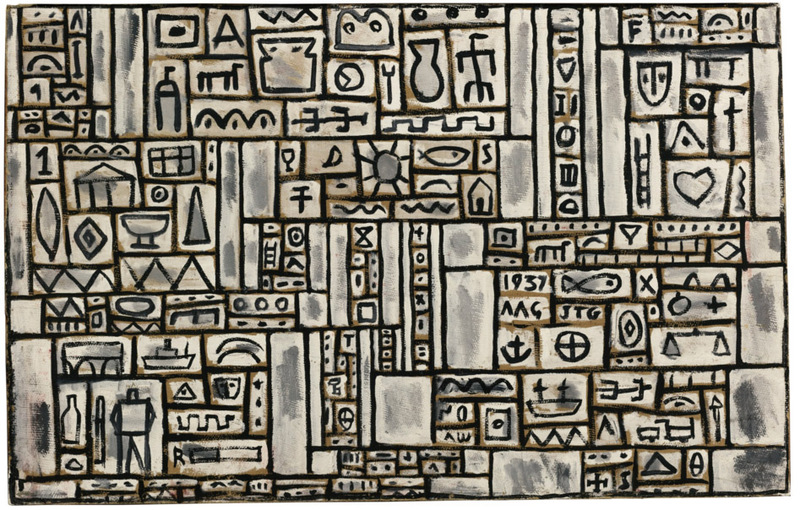 What I'd known of Torres-Garcia's work were paintings such as the one above, which are like complex hieroglyphics, hidden stories of life. He was born in Uruguay in 1874 and died there in 1949, but between those years he lived for many years in Europe, and was active in the avant-garde; he also lived in New York from 1920-22. The toys grew out of his teaching at a progressive school in Barcelona. While in New York, he exhibited his toys at the Whitney Studio Club. 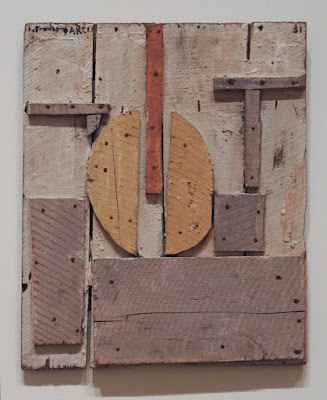 The work by Torres-Garcia that most excited me––work I'd been completely unaware of––were painted wood constructions: simple, lively, sophisticated, playful, beautifully composed and colored. Many were wood reliefs, painted in subdued colors. The one above was somewhat unusual in the variety of its forms. 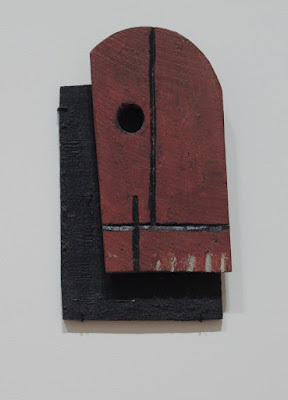 Some of the pieces were free standing, and to my eye, although abstract, related to the figure. 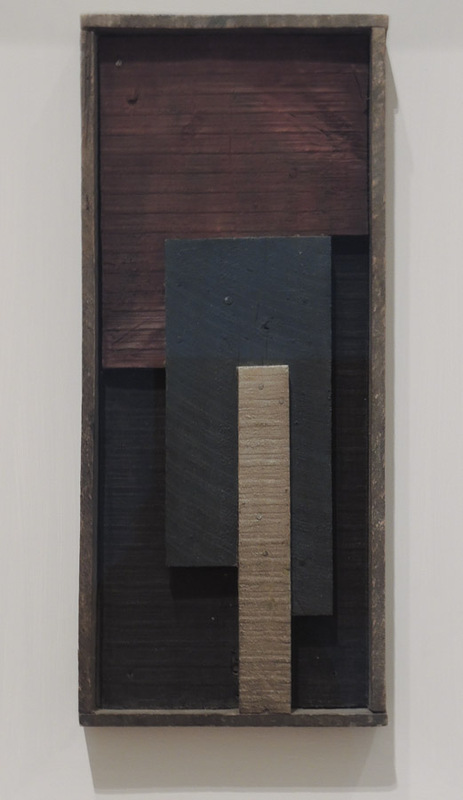 This work has a very spare geometry, with beautifully balanced elements, painted in subtly rich hues. I so enjoyed seeing the range of Torres-Garcia's ideas for his constructions: this one freestanding, the painted elements making it seem as though it's made of several pieces of wood; but, moving to the back, it's one board, with a shelf. This is an interesting kind of illusionism: making a whole feel like parts put together. 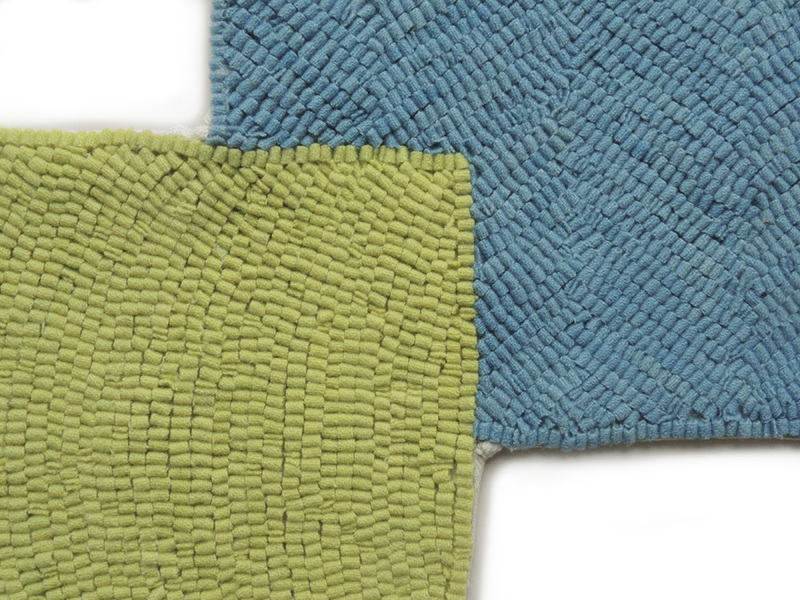 Here a complex layering of forms is made even more lively by the addition of color shapes within each physical shape. It is playful, and serious. A curved shape atop a rectangular one, this is another work playing lightheartedly with allusions to the figure, an amusing portrait. 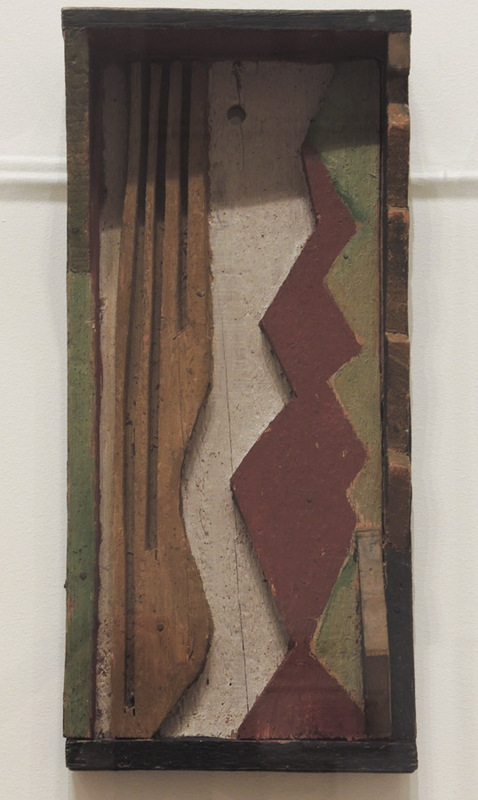 Another aspect of these works that makes them so rich is the rough character of the wood, all looking as though it was salvaged from scrap heaps and utterly transformed. There is a lively contrast between the irregular surfaces of the wood and the carefully balanced compositions. I love the way the small yellow circle stops the red vertical on its way down. It's a small emphasis within the vertical and horizontal geometry. 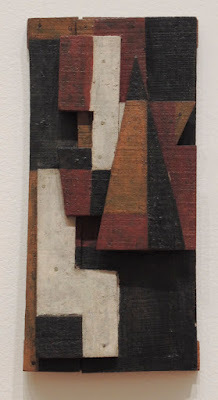 There were many paintings in the show, but the ones that most interested me were those that felt influenced by the wood constructions in their dramatic illusion of form; these were painted after Torres-Garcia returned to Uruguay. 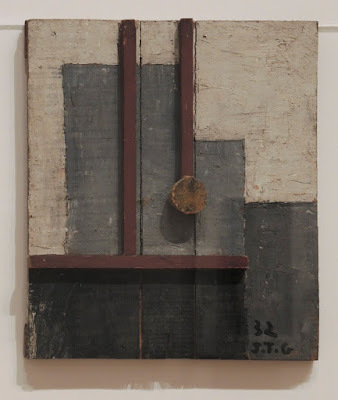 This painting feels built to me, sculpted rather than painted. 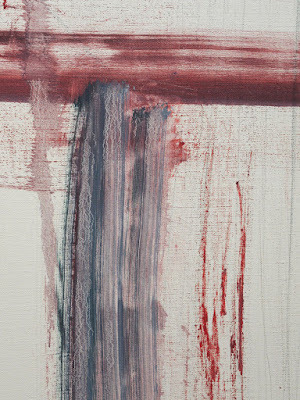 ....and when seen closely, the paint looks like the artist was feeling the solidity of these forms as he worked. 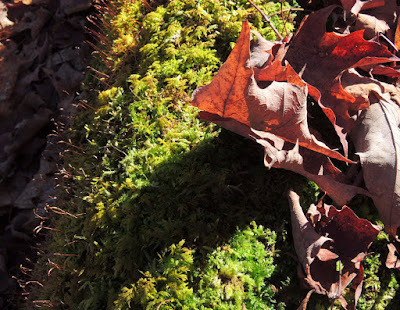 You'll notice that the color in my photos is different in the detail and entire painting: I'm not sure which is closer to the actual painting, so I left them a bit different. This show was very exciting, a real treat, and it's on until February 15. Pointed Arch, egg tempera on calfskin parchment, 7 1/2 x 10 in. I had to giggle when I began this painting: the shapes were so humorous to me with the outstretched "arms". 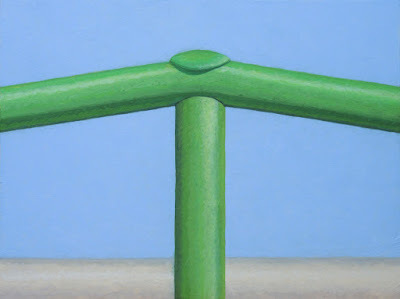 I begin my paintings quite loosely, in a very painterly fashion, and make them more precise as I work; I thought the tightening up of form would bring more gravity to the image, but it still seems funny to me (though maybe not to you). Which is fine; I like humor in art. The title, Pointed Arch, continues the silliness, because of course this isn't an arch since it's supported at its center. Here's a detail of the little lozenge shape that caps the arch, probably hiding the bolt holding the cylindrical parts together. 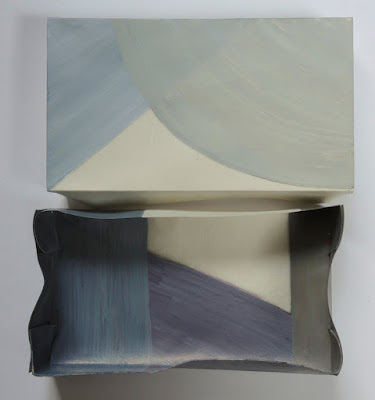 I deliberately softened the top edge of the light gray form, so it would settle into the blue; this is different from the sharp dark green edge, which pops that form forward. 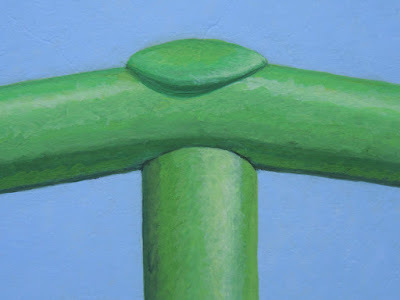 Although this image is very simple, it is always a balancing act to pull a painting together. Today was a beautiful day, and my walk in the woods was a delicious experience: yesterday's rain enhanced the spicy-sweet scent of autumn, and heightened the intensity of mossy greens. Nestled amid browns, the bright greens of moss are startling. In spring and summer, when the world is green, the mosses seem more ordinary. Looking closely, we see varied textures; here, frothy, like an unkempt head of hair. 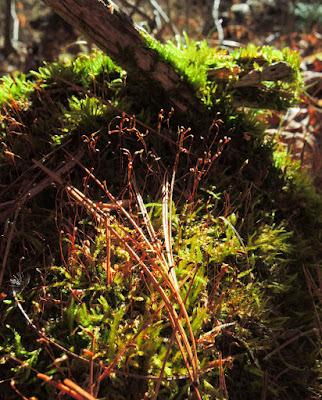 ....which carry the spores for mossy reproduction. 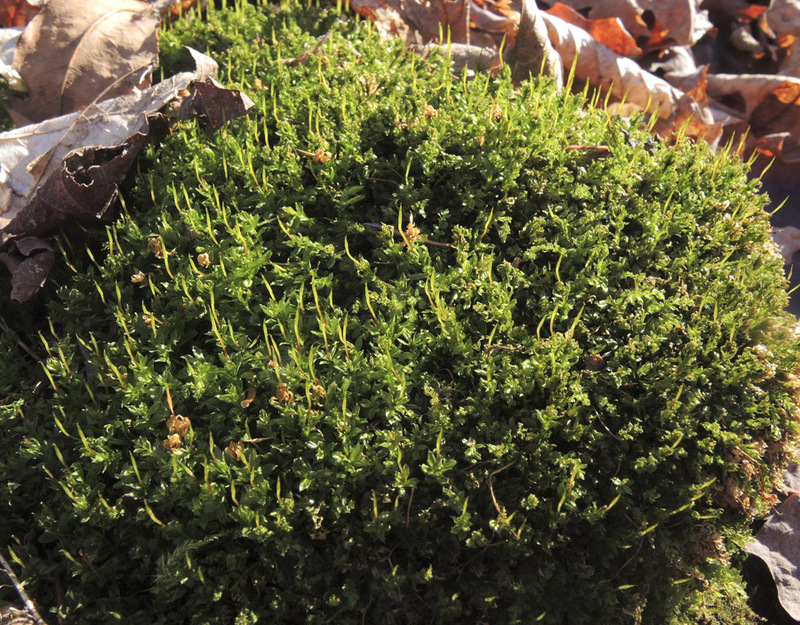 Here, another kind of moss, a beautiful mound with a different texture, and pointed little green fruiting bodies. I'm actually not sure what these are, but they're wonderful looking, like Kali, the many-armed goddess, rising a couple of inches above a rock. 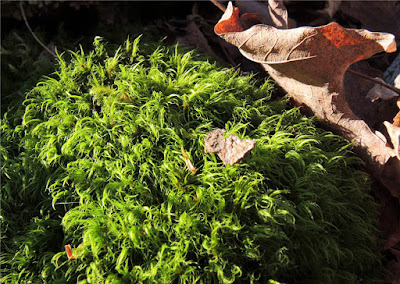 Finally, here are two mossy plants that I believe aren't actually mosses, but are clubmosses (I think). 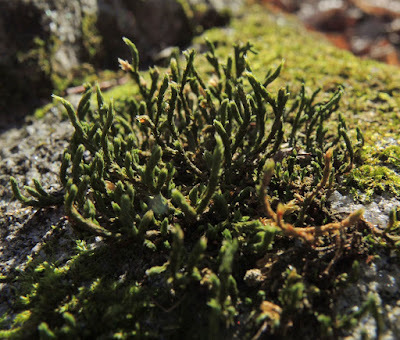 They are different from true mosses in that they have a vascular system, meaning stems to carry water and nutrients. They are more "sophisticated" in this than mosses, which lack this system. 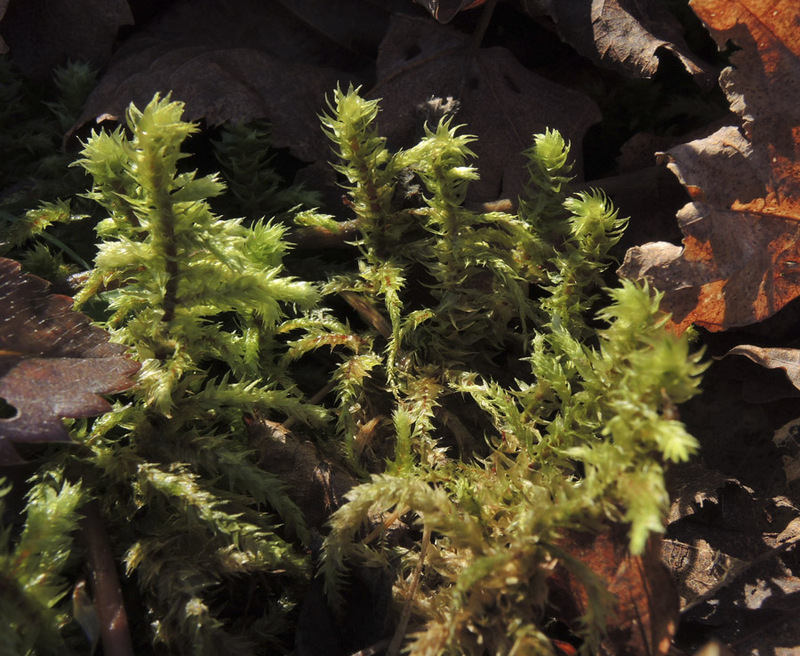 But whether mosses or clubmosses, the bright greens amid the browns are heartening. They remind us that life of all kinds continues even though it seems in suspension during late fall and winter. 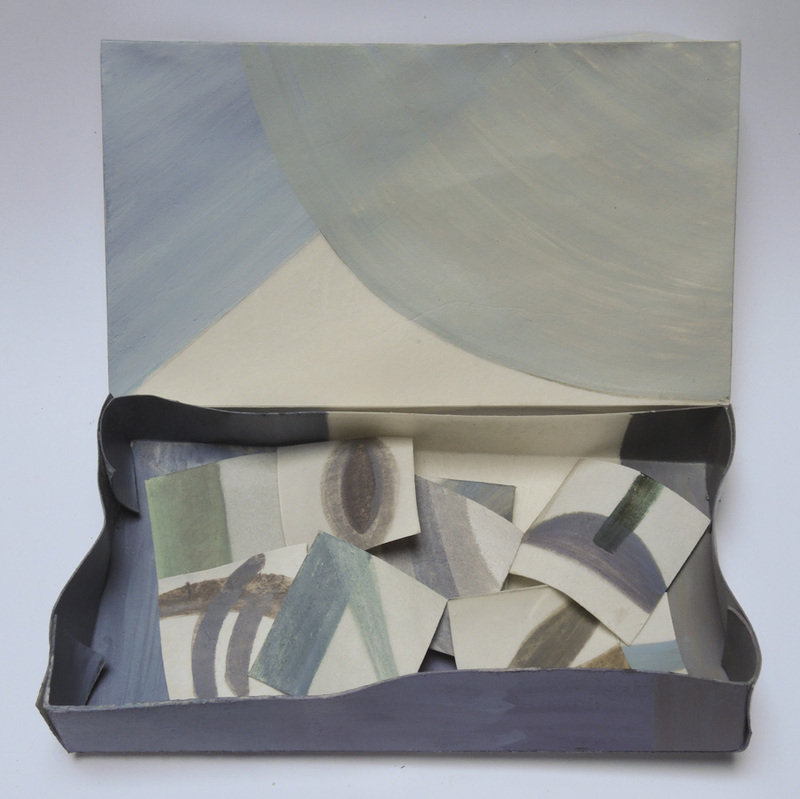 Grays, cover and box contents; egg tempera on calfskin parchment, 3 x 5 1/4 x 3/4 in. I've just completed another in my series of boxed paintings: small boxes made out of parchment, containing a dozen very small paintings. I paint the boxes based on a color or shape theme, such as Reds, Squares, Black and White, etc. 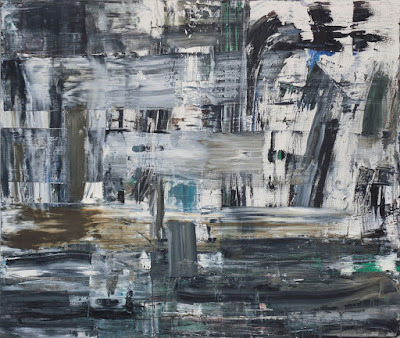 For this piece I mixed grays, all from color, none from black or gray pigments, resulting in grayish-blues, grayish-browns, grayish-greens: a great range of hues. The cover is light in value, and the inside dark. 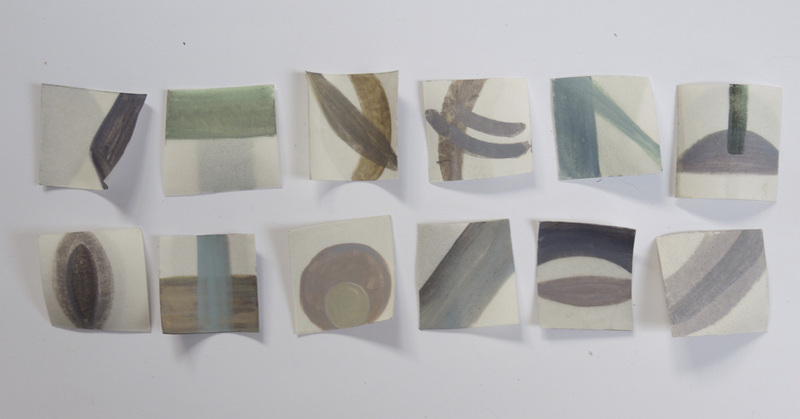 Both have overlapping shapes and leave some parchment bare of paint. Grays, paintings, side 1, ca. 1 1/4 x 1 1/4 in. Because the parchment is translucent, after working on one side of the little painting, I hold it up to the light to work on the other side, in order for them to relate to each other. Sometimes it even seems as though the reverse side has an active part in the composition, such as in the second from the left on the top row. 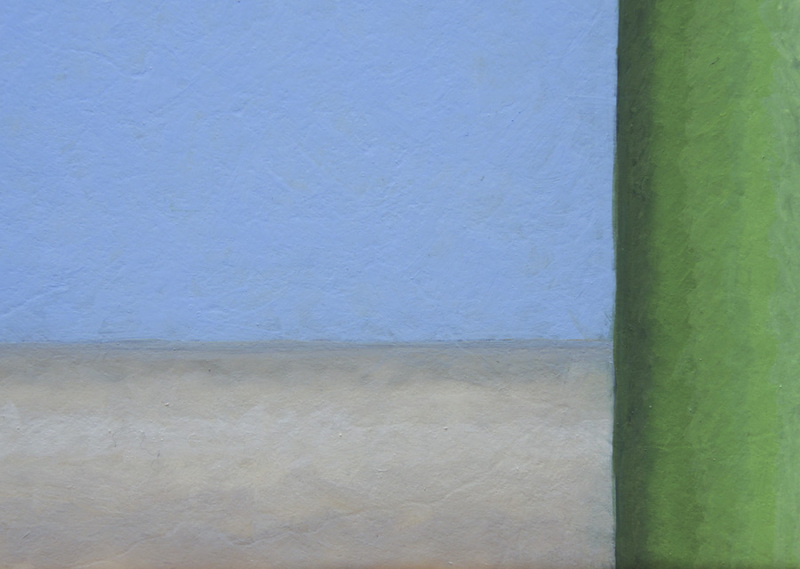 That green square is all that's painted on that side; the horizontal rectangle below it is painted on the other side. It's a challenge, a pleasurable one, to come up with a range of compositional ideas to fill the box. Louise Fishman, Easy Living, 2014; oil on linen, 64 x 34 in. We can't help but bring our taste and our sensibility along with us when we look at art. 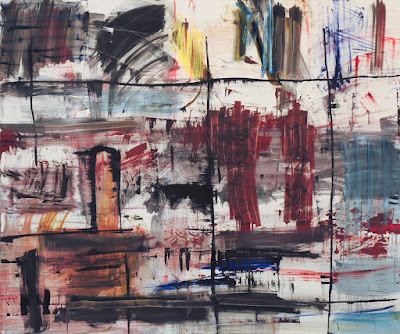 Many years ago, my teacher Philip Pearlstein noted that I had an "architectonic sensibility", and my desire for clarity and order guide my taste. 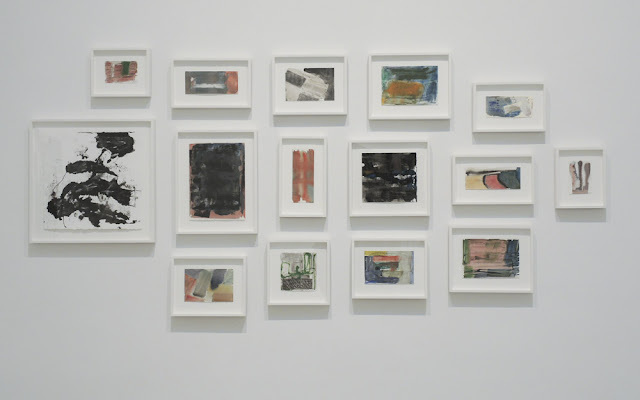 It is therefore not surprising that my favorite paintings in Louise Fishman's exhibition at Cheim & Read were those with the most spare compositions. I admire Fishman tremendously––her continuing muscular explorations of painting are inspiring––but I don't always love all her paintings. I do love Easy Living: there is tremendous energy contained in a very taut structure. The speed of the brushstrokes is in tension with their clear spacial description. 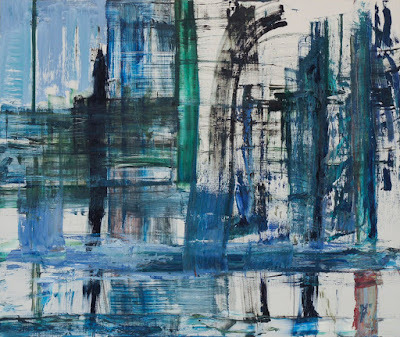 This kind of painterly immediacy, with its accidental flows, can only be harnessed successfully and repeatedly by a painter who has been working seriously for many years. 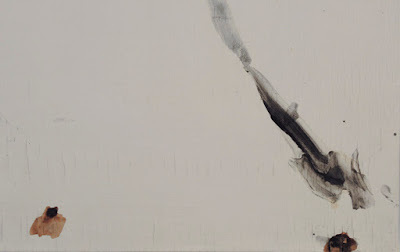 Some of my other great favorites at the Fishman show were a group of small watercolors, painted over the past few years. 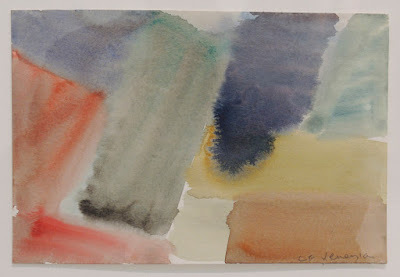 Louise Fishman, Untitled, 2011; watercolor on paper, 6 x 9 in. Louise Fishman, Untitled, 2013; watercolor on paper, 9 7/8 x 4 in. 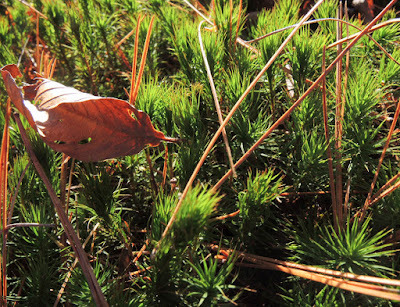 They are full of air and light, and are succinct in their form. Louise Fishman, Living Forward, 2014; oil on linen, 66 x 39 in. 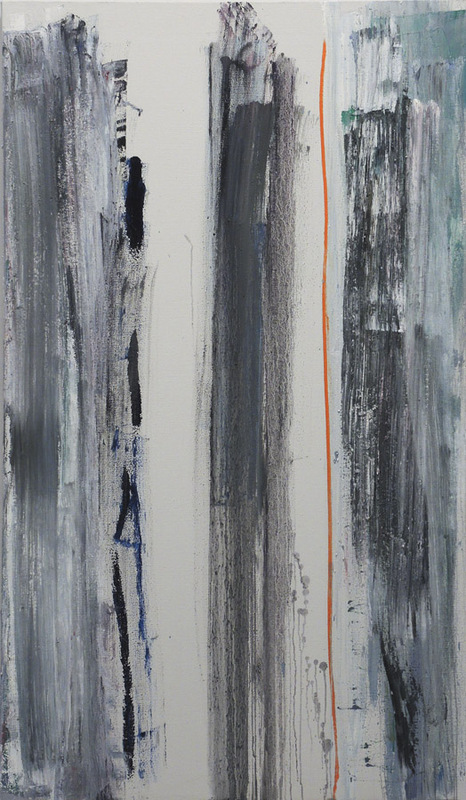 Living Forward is powerful with its three massive vertical forms, interrupted by canvas canyons, and startled by a thin orange line. 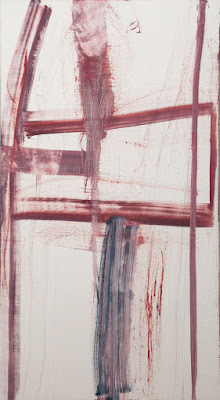 Louise Fishman, Sven Jesper, 2015; oil on linen, 74 x 88 in. My favorite among the larger horizontal paintings was Sven Jesper; its heavier bands of blackish-grays at the bottom anchor the more complex spaces above. The strokes of lighter paint pop up to the picture plane, allowing the area on the right, with its bare canvas, to settle back. There are tough barriers to entry, but we can find our way into the space. 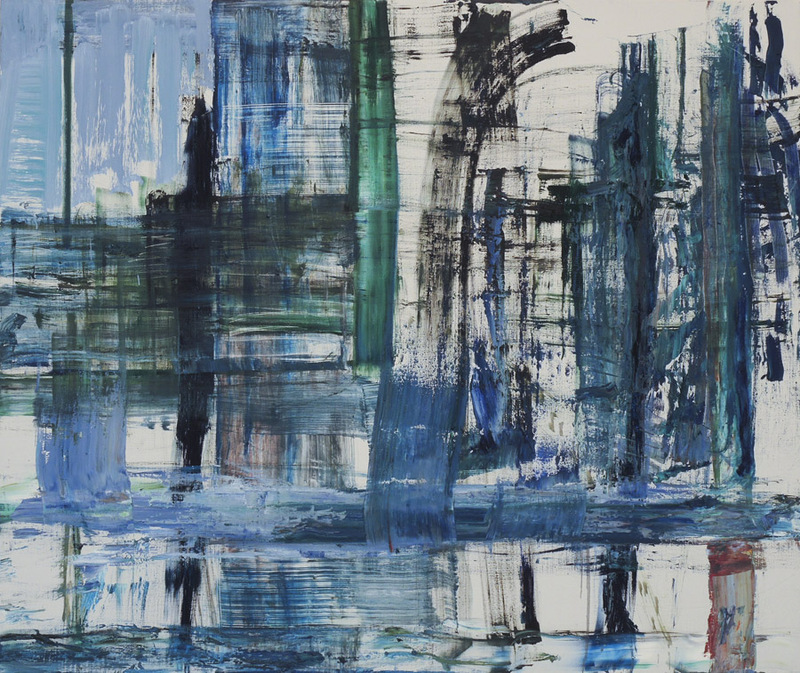 Louise Fishman, Bel Canto, 2014; oil on linen, 74 x 88 in. 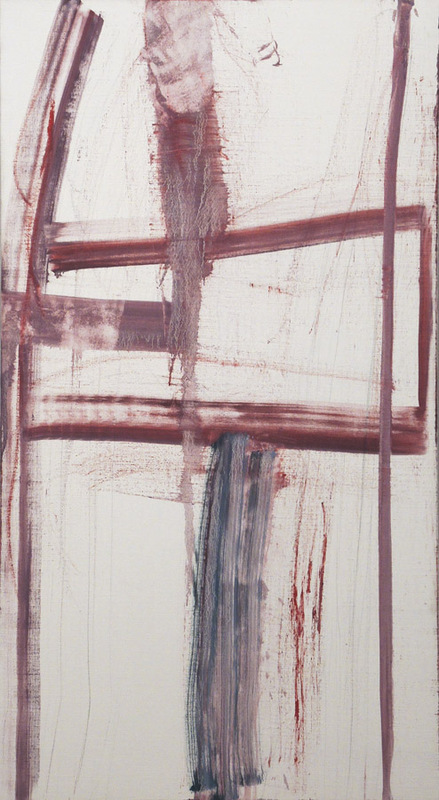 Louise Fishman, Credo, 2015; oil on linen, 72 x 88 in. ....and Credo, I couldn't find my way in amid the welter of rushing colors and marks. My orderly sensibility wanted to go back to the spareness of Easy Living, a painting that seems reticent alongside these others. 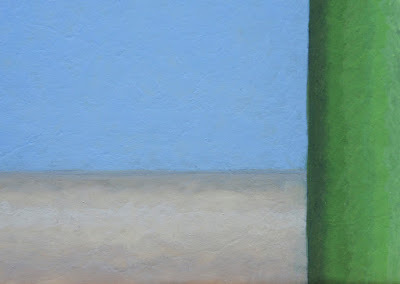 But, a funny thing has happened as I've been processing these photos: I like the paintings more and more. Of course I'm now seeing them in a small size, with the paint flattened out, with the energy of the actual work dissipated on the computer screen, but it has allowed me to see the structure more clearly and not be overwhelmed by the paintings' complexity. I wish I could see this show again. 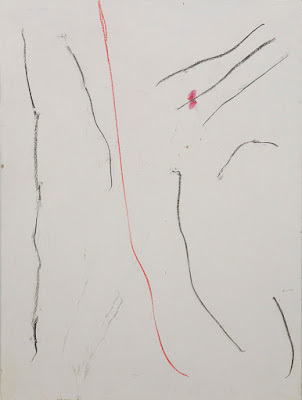 Josh Smith, Untitled, 2014; rabbit skin glue, calcium carbonate, white pigment, ink, watercolor, graphite, grease pencil, and paint pen on panel; 32 x 26 x 2 1/2 in. The visual experience couldn't have been more different around the corner at the Josh Smith exhibition "Sculpture" at Luhring Augustine (this show is over). 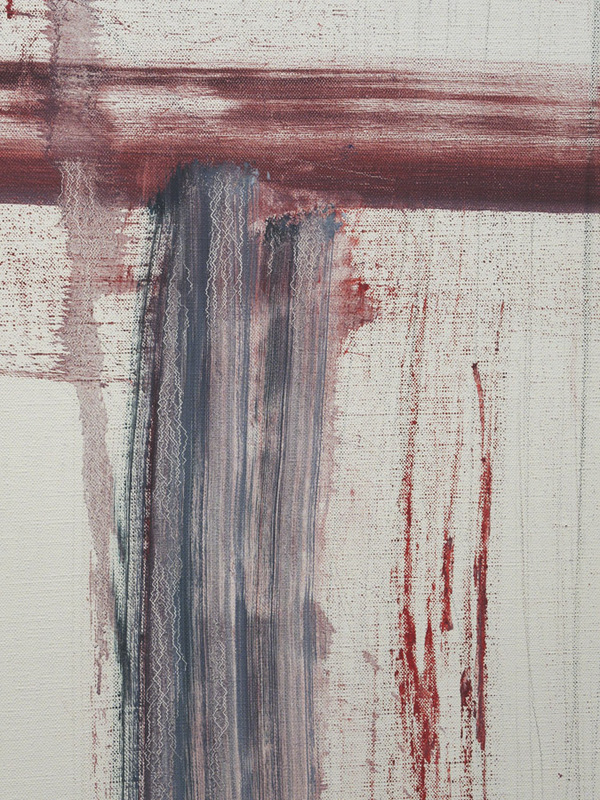 On mid-sized gessoed panels were minimal marks, made with various painting and drawing tools. 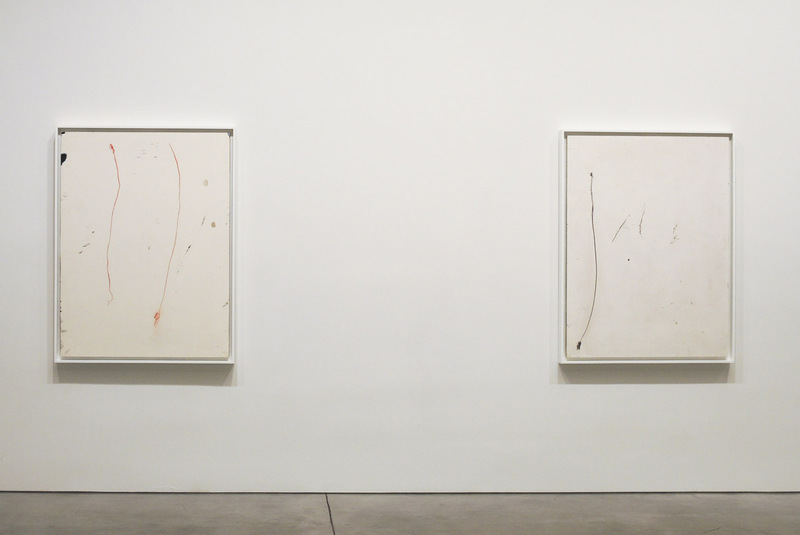 I felt pleasure in seeing the off-hand marks, their casualness, on the open white ground. They reminded me of Richard Tuttle's work, especially some of his most spare watercolors. 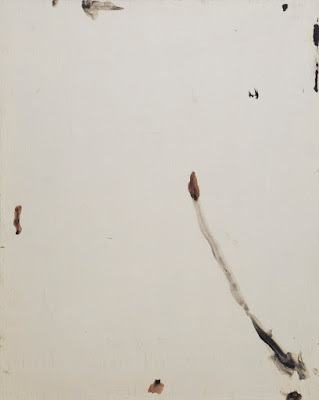 The gesso of the panels––made with rabbit skin glue and calcium carbonate, a true gesso––was full of cracks, probably because of being prepared incorrectly. 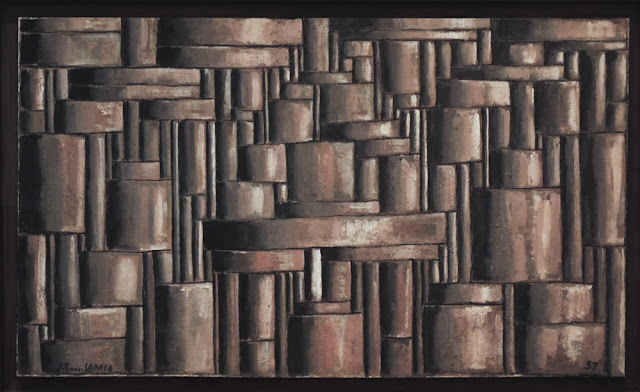 Smith used this occurrence as a strange conceit, calling the show "Sculpture"; he said "You could call them paintings, but they're not paintings. They're sculptures. They have to be sculptures." It's a very odd thing to say, though I suppose it's not any stranger than Frank Stella calling his huge 3 dimensional works "paintings". Josh Smith, Untitled, 2014; rabbit skin glue, calcium carbonate, white pigment, ink, watercolor, grease pencil, and paint pen on panel; 50 1/2 x 38 1/2 x 2 1/2 in. 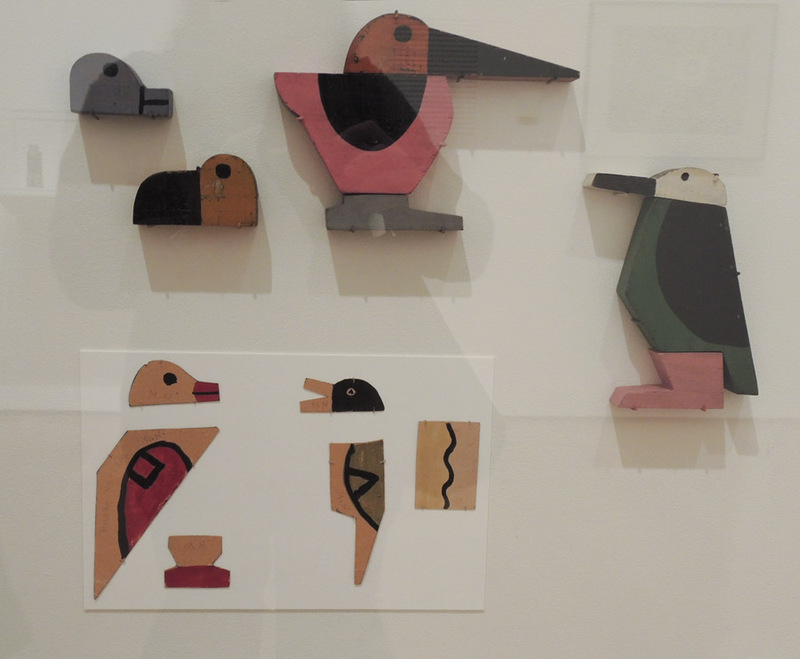 I liked some of these works very much: they satisfied my sensibility. The balance of line and emptiness felt right. 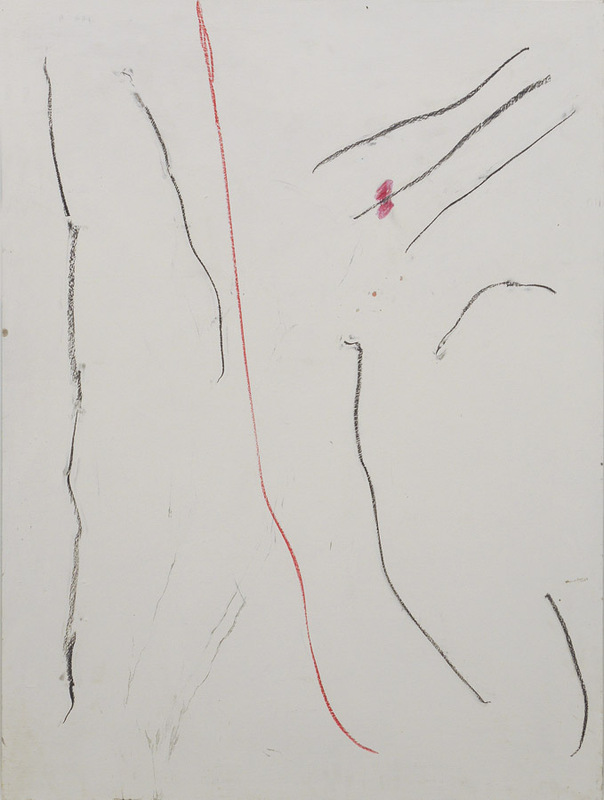 Josh Smith, Untitled, 2014; rabbit skin glue, calcium carbonate, white pigment, graphite, grease pencil, and paint pen on panel; 32 x 26 x 2 1/2 in. 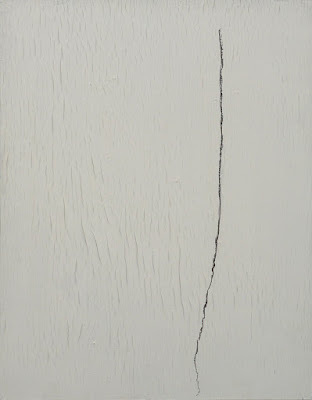 In the work above, the single line moving erratically down the surface has a poetic relationship to the lines of the cracked gesso. Zigzags and Curves, hand dyed wool on linen, 14 x 16 1/2 in. Two overlapping rectangles; two colors: a very simple idea. To add a little complexity, a different hooking pattern in each rectangle: repeated zigzags, and gentle curves. 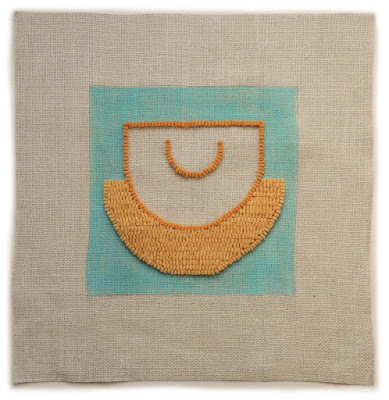 I wasn't sure that this would be enough visual interest to carry the piece, but because it's fairly small, I think it works, and I like its minimal quality. The patterned hooking causes the edges to become especially uneven, but that doesn't bother me much; irregularity tends to be a characteristic of rug hooking. 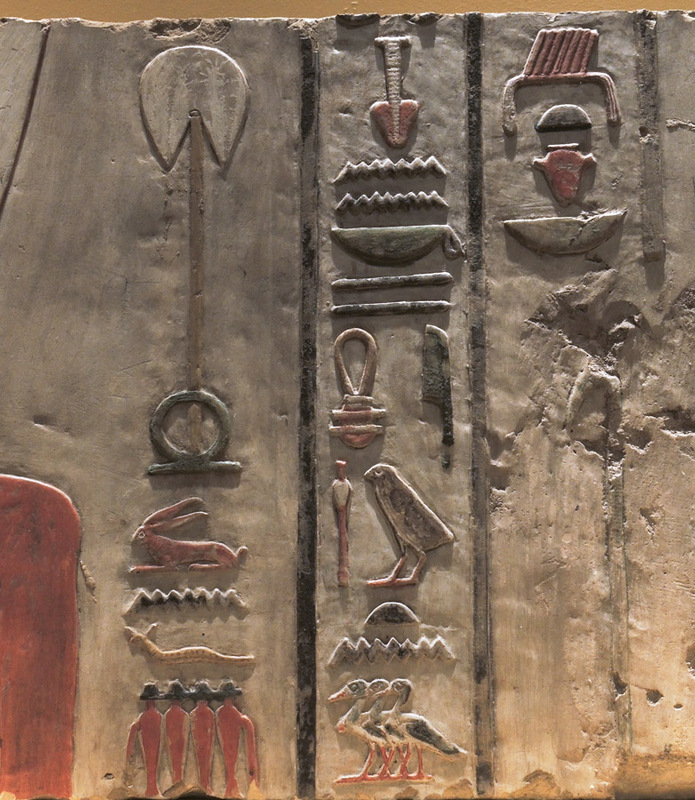 Lintel of Amenemhat I and Deities, detail, ca. 1981-1952 B.C. 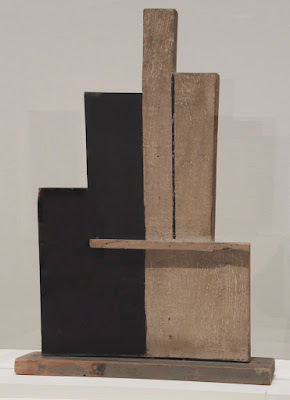 ; limestone, paint, 14 1/2 x 68 in. The exhibition currently at the Met, "Ancient Egypt Transformed: The Middle Kingdom" is spectacular. Beautifully installed and lit, with room to contemplate each object with quiet attention, the show is full of remarkable objects. 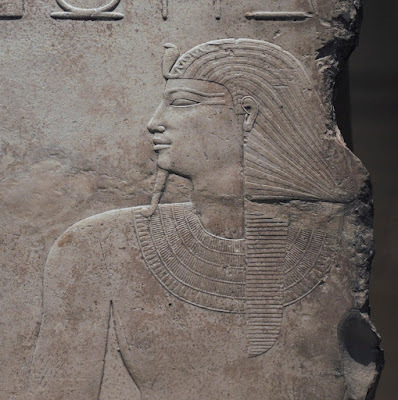 They are gathered from the period of the Middle Kingdom, around 2030-1650 B.C., when Egypt was reunited after a period of decentralization. Did the fact of having strong rule lead to the making of such refined and sensitive sculpture? I don't know, but I do know that the works are entrancing. 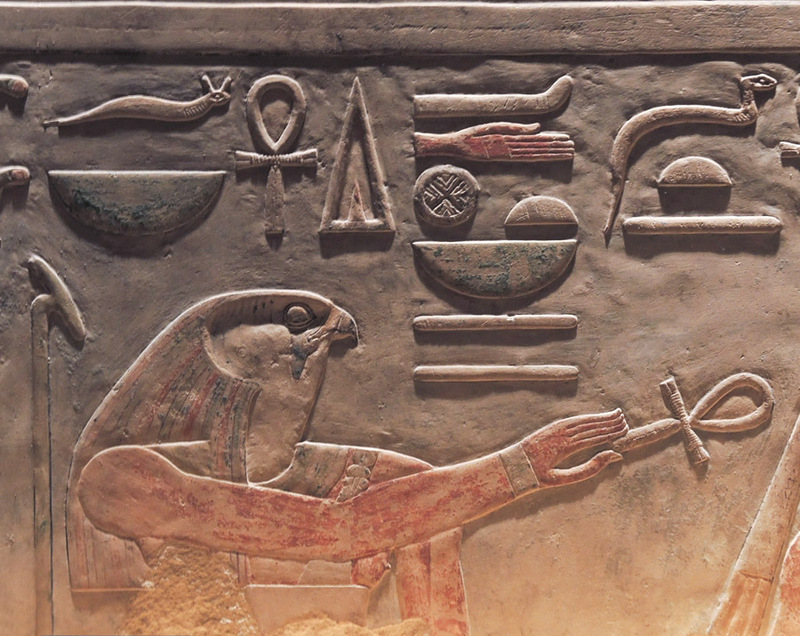 Above, the god Horus, his headdress still showing patterns of paint, holds an ankh, a sign for eternal life. 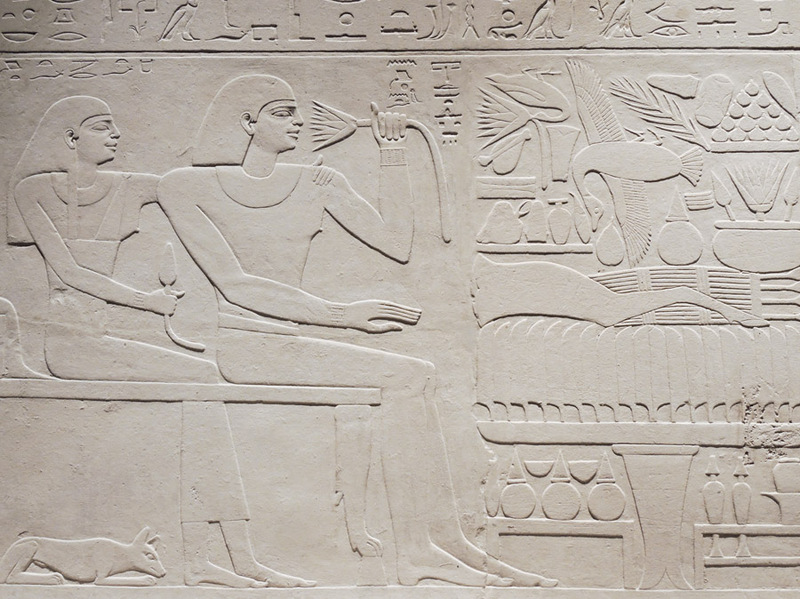 Relief of Nebhepetre Mentuhotep II and the Goddess Hathor, detail, cas. 2010 -2000 B.C. 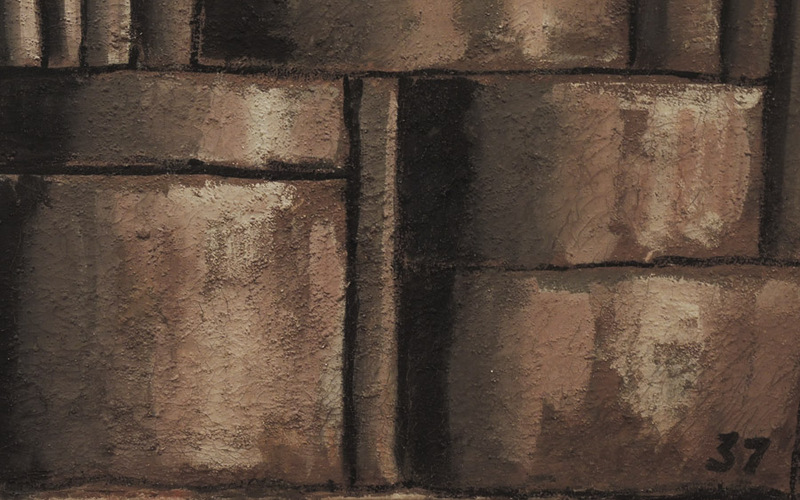 ; limestone, paint, 14 3/16 x 38 9/16 in. I love relief carving, Egyptian and Persian; perhaps it's because it is intermediate between painting and sculpture in the round. 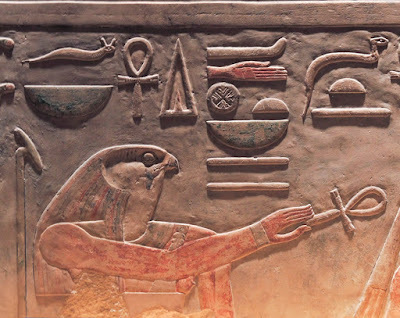 The carefully carved ideograms, here and in the first image, give me such keep pleasure in their keen observation and their clarity. 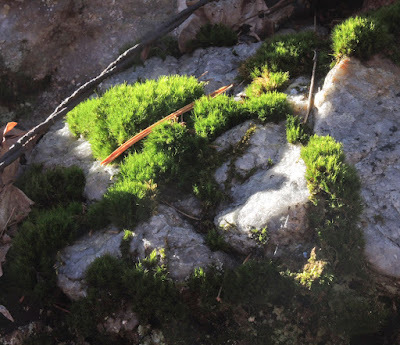 When the form is idealized, it is still based on an understanding of visual reality. The modeling of form is minimal, but because the outlines are so carefully drawn, they imply fullness. 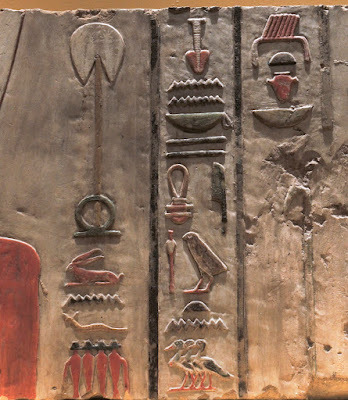 Stela of the Overseer of the Fortress Intef, ca. 2021-2000 B.C. ; painted limestone, 30 11/16 x 55 7/8 in. 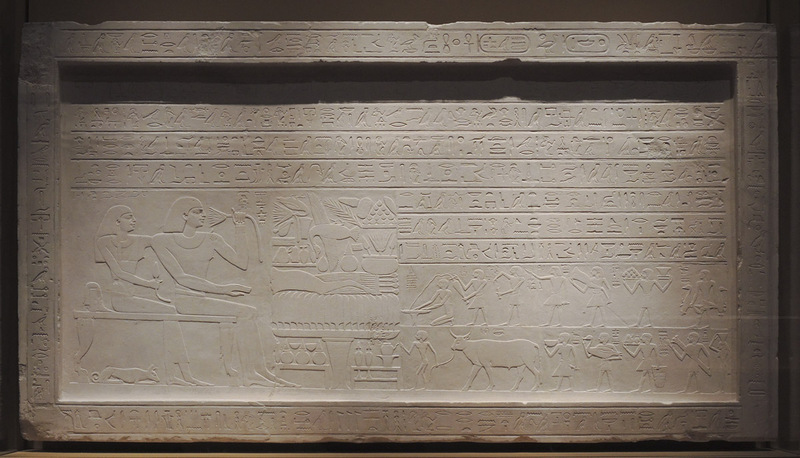 This stela is quite incredible (click to enlarge images!) in its delicacy. 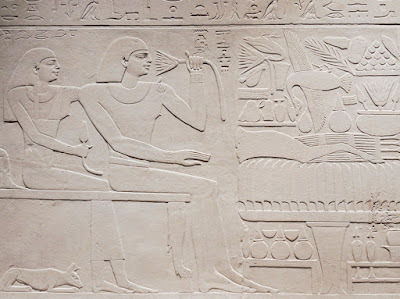 There is as much care taken with the carving of the hieroglyphs as with the offerings and the portraits of Intef and his wife. There is very little modeling, just a light curve at the edges of forms, but the effect is poetic in the rhythms of shapes and in their reserve. Face of Senwosret III, ca. 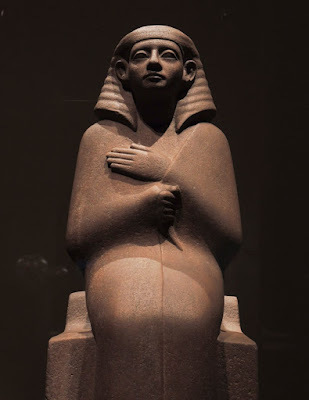 1878-1840 B.C. ; red quartzite, 6 1/2 x 4 x 4 1/2 in. 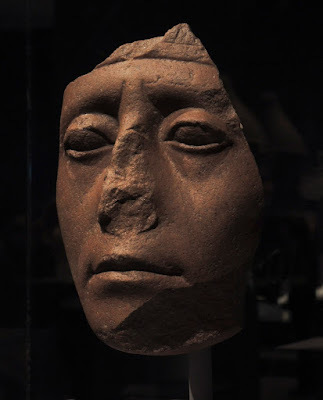 The forms in Middle Kingdom sculpture were not solely idealized: in this portrait head of Senwosret III we can feel the presence of a living man; the stone seems soft, like flesh; the lips about to part, the eyes to blink. Thousands of years old, this portrait might be of a contemporary. 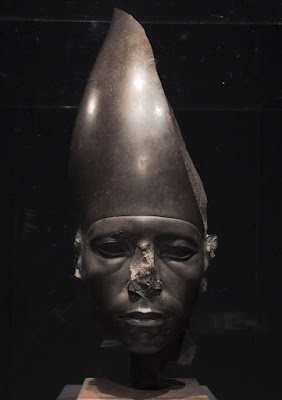 Head of a Statue of Amenemhat III Wearing the White Crown, ca. 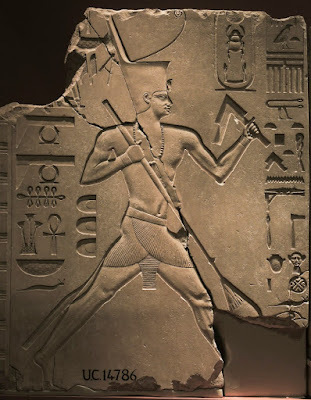 1859-1813 B.C. ; greywacke, 18 1/8 x 7 5/16 x 10 1/16 in. This portrait too has a precisely observed realism that brings an ancient character to life. 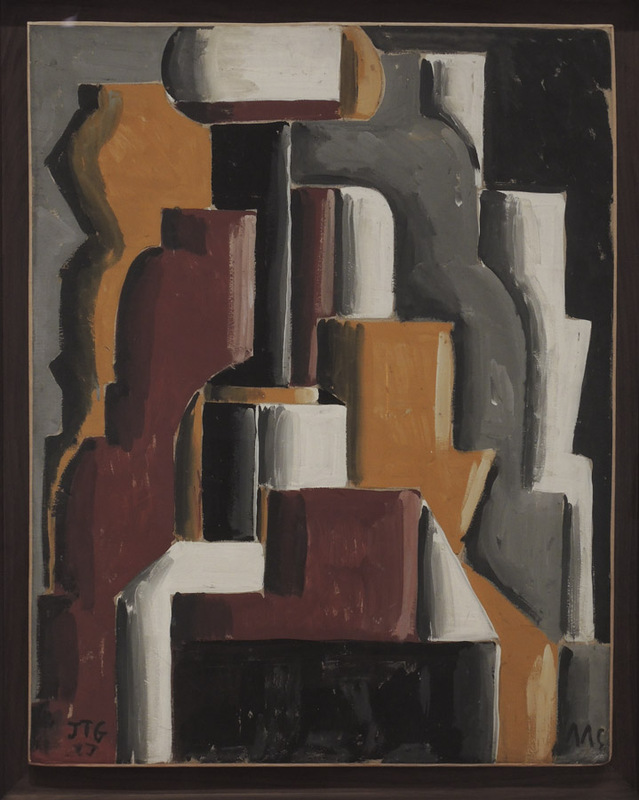 It is especially vibrant because of the contrast between the carefully rendered face and the abstract form of the tall crown. 31 x 53 x 4 1/2 in. 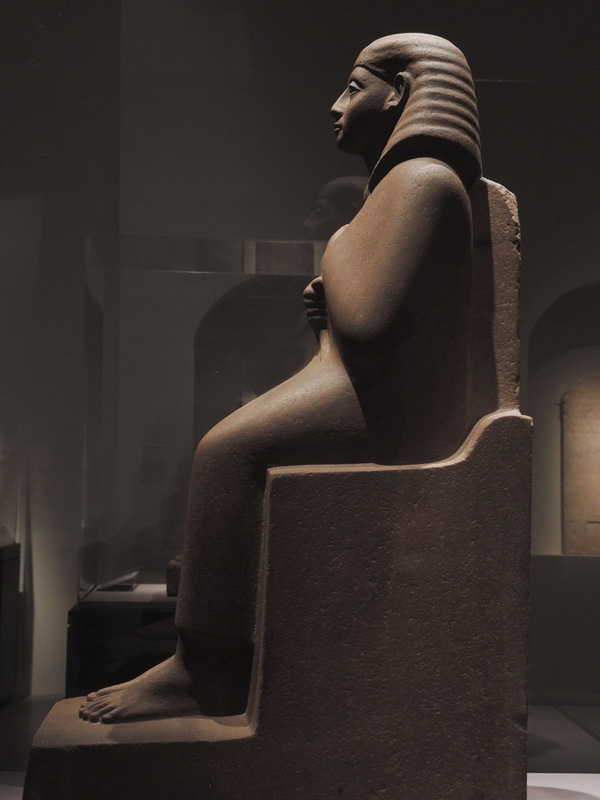 Here is another king, but rendered as we usually expect in Egyptian art, in an idealized form. I love the pattern of headdress and collar, and the way the delicate ear stands forth. I especially delight in the picturing of animals in the reliefs. 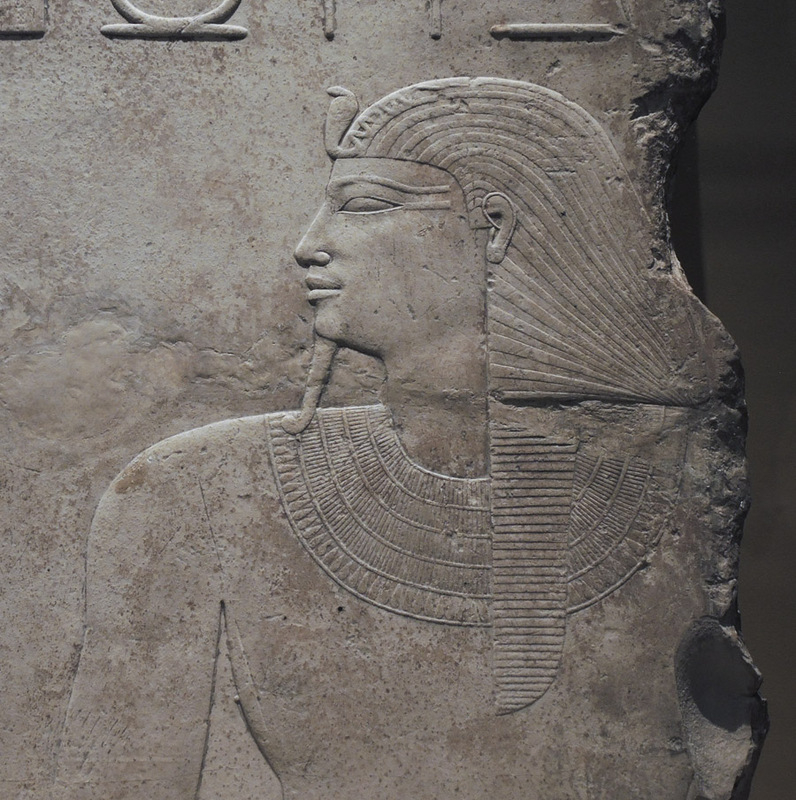 The Egyptian sculptors had a true affinity for depicting them. Here, the patterns of the ducks' feathers are described in paint. Relief with Crocodile and Fish, ca. 1981-1919 B.C. 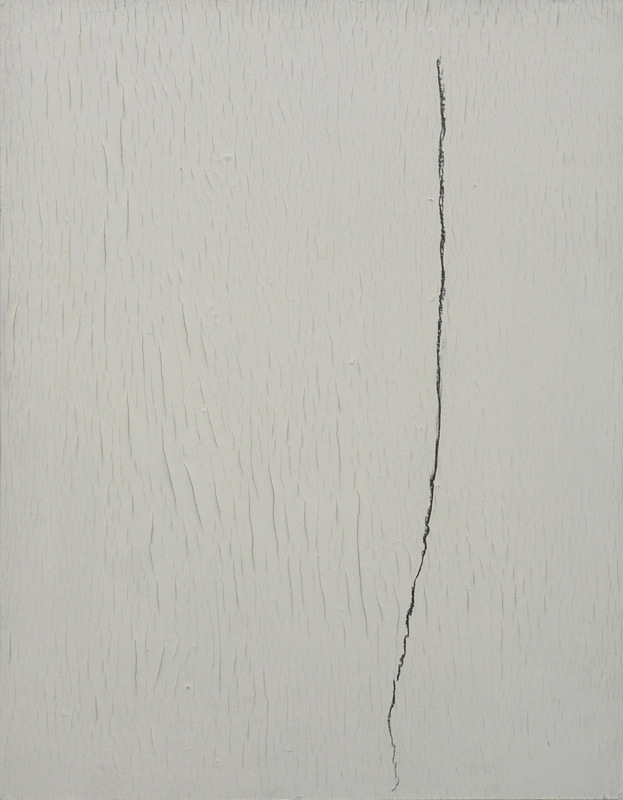 ; limestone, paint, 11 1/4 x 28 5/16 in. 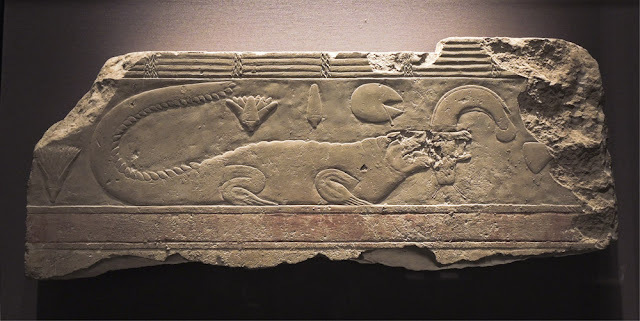 The elegant form of the fearsome crocodile flows across this relief. He has a catfish in his mouth, and water plants float above. 6 1/4 x 1 9/16 in. I love the geometry above the figure in this relief. It represents wooden architecture. 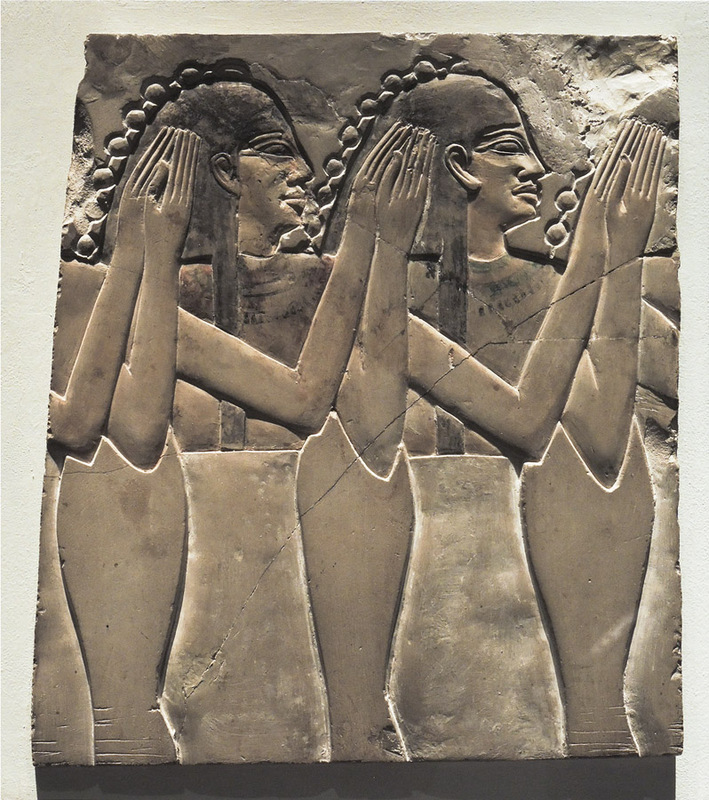 Relief of Clapping Women, ca. 2051-2000 B.C. 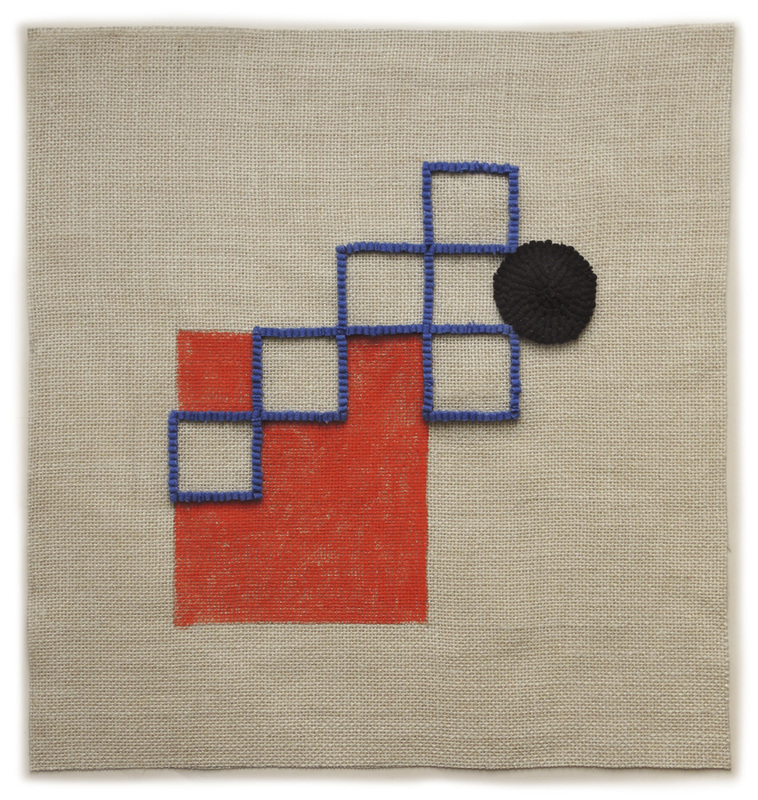 ; limestone, paint, 12 1/2 x 11 x 1/2 in. Because this is a sunken relief, there's a fascinating flipflop in the figure-ground relationships: the vase-like forms between the women's bodies take on more importance than the bodies themselves. The arms and bodies and negative spaces create a lively rhythm, appropriate to the subject. Shrouded Royal Statue, Standing, ca. 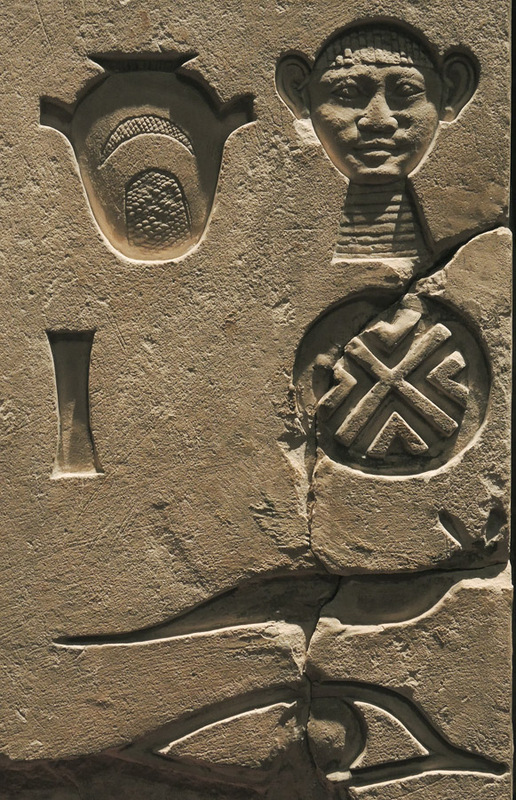 2124-1981 B.C. ; sandstone, 55 x 19 x 13 1/2 in. This sculpture truly stopped me in my tracks: its simple form was so powerful and moving. Because the body is shrouded, its details are hidden, except for the bony knees, which become a kind of human landmark, a connection to the earthen realm from that of the spiritual. Statue of the Sealer Nemtihotep Seated, ca. 1981-1802 B.C. ; quartzite, 30 1/8 x 9 13/16 x 30 5/16 in. 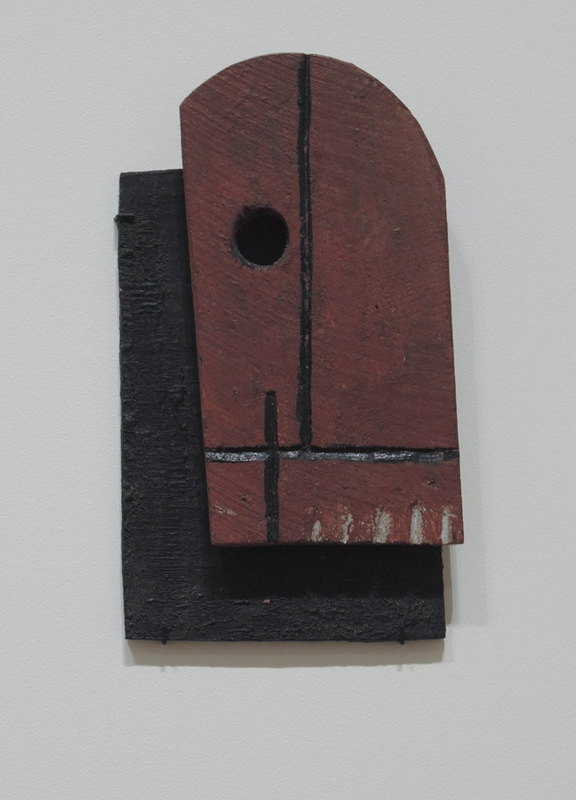 This piece is another which is idealized and simplified, but still having tremendous emotional presence. It is so interesting to think of this and the one above alongside the two portraits that are much more naturalistic. Each style has its power, each moved me deeply. It is the work itself and not its style that is important. 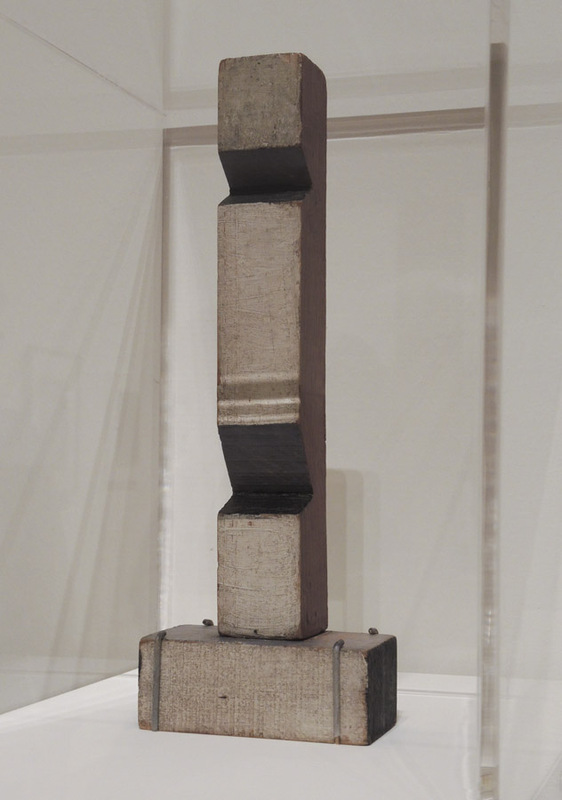 The forms are so beautifully integrated in this sculpture, leading to a true sense of the eternal. 43 11/16 x 60 5/8 x 11 in. Lastly, a sunken relief of a king, very finely wrought, with clear definition of musculature. It's unusual to see a king running, but here it is for a ritual: he is running towards the god Min, who is a fertility god. 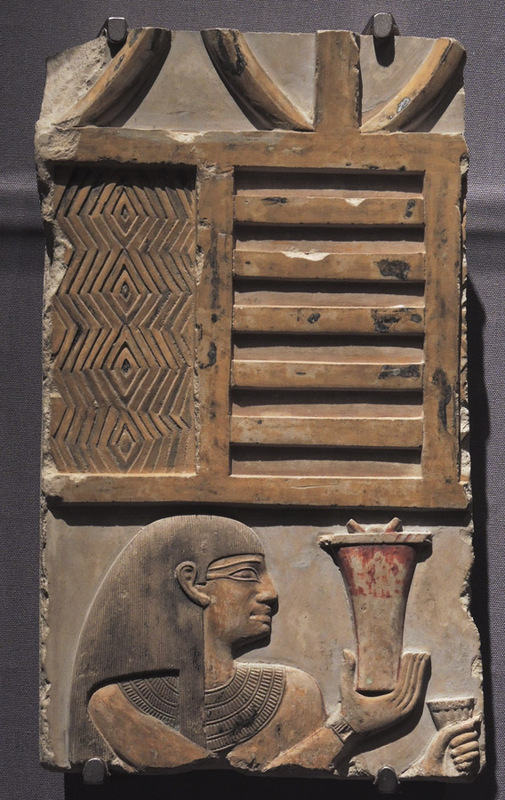 What I really enjoyed about this relief were the ideograms surrounding the main figure, especially the small, very expressive head. 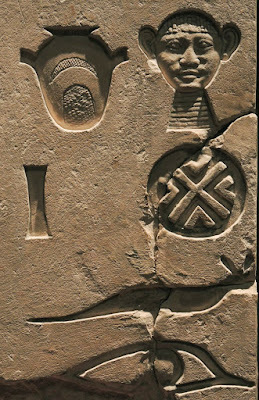 I asked my Egyptologist friend about these images and she told me that the top line reads, from right to left, "in the midst of"; the second line "city" (the crossroads), then an end of word sign; then the horned viper (which she corrected me from thinking it was some kind of giant slug) means "his". The eye probably starts another word, but the stone is broken off below it. The fact that we can read languages from so far in the past is very exciting to me. 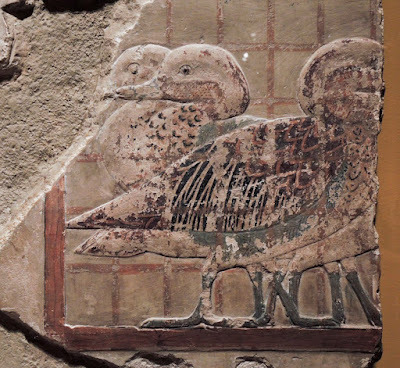 What is most thrilling, though, is to be able to see so much beautiful work from the rich visual culture of Egypt's Middle Kingdom.